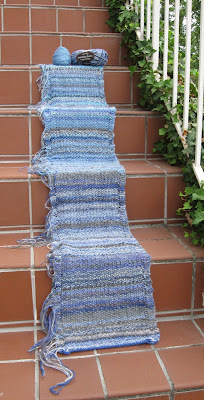 Tumbling down four steps is 8 months of my 2012 Sky Scarf project. 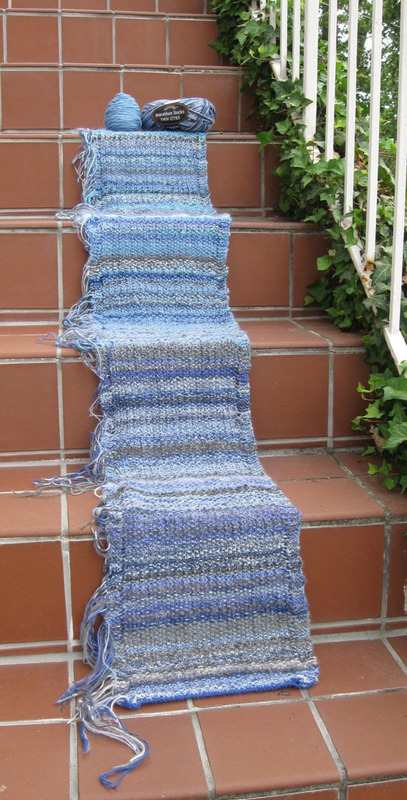 The scarf is currently 72 inches long and 12 inches wide. At this rate, it could be over 100 inches long by the end of the year! What do you think? Should I continue as planned? Or, stop at a "reasonable" or "wearable" length? What would that be? You think one could wear a 100+ inch long scarf/wrap/stole? With hurricane Issac hitting the gulf states recently, there was the potential for storm cloud-ridden skies, heavy rains and the need for battleship gray and charcoal mohairs, but we got minimal affects in our area. It's amazing how different the sky is at different times of day and through the seasons. You really learn to be observant over something we generally take for granted by doing a project such as this. I may have to pop over to Lea Redmond's Conceptual Kntting blog and see what she and others have done.